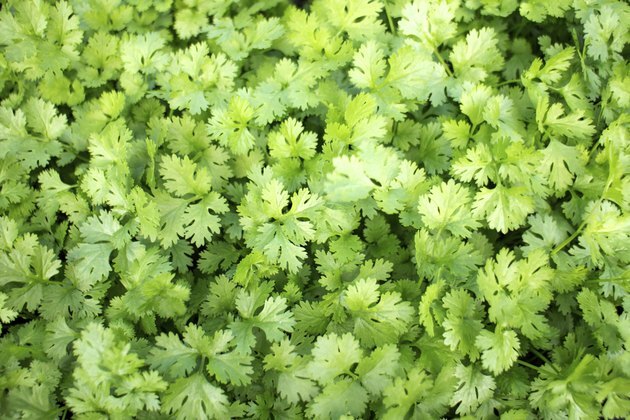 Cilantro adds a distinct, lively flavor to your food, and it's easy to grow at home. Cilantro grows best in sunny spots. You expect the plants to grow about 18 to 24 inches tall and 12 to 18 inches wide. You don't need to prune cilantro until you're ready to harvest. But removing the flowers can keep this annual herb growing longer. Sterilize pruning shear blades with rubbing alcohol before and after pruning. Lightly pruning cilantro keeps the plant neat and gives you a small harvest of leaves you can use in your food. The leaves sometimes turn yellow or become scorched or damaged from the sun, pests or diseases. Prune any yellow, wilted and otherwise damaged leaves. When you're ready to harvest cilantro leaves, snip the stems at their bases when they are 4 to 6 inches long. You can harvest just a few stems or up to one-third of the stems. Don't prune more than one-third at a time because cutting too many stems can weaken the plant and keep it from growing more. Weakened plants may also produce flowers earlier, which shortens the lifespan. Pruning cilantro clumps gives you a mix of large, mature leaves and small, tender leaves for the kitchen. Cilantro may resprout after pruning all the leaves and stems, but the plant may also fade and die. Grasp the base of the cilantro plant with one hand, and prune all the stems at their bases, 1 to 2 inches above the soil surface. To keep the clump together, you can tie twine around the base. Stand clumps of cilantro stems in cold, clean water to help keep them fresh until you're ready to use the leaves. Cilantro dies down after it flowers and sets seed, but pruning the flowers helps extend the growing season. As the plant nears the end of its cycle, it grows flattened clusters of white, pink or pale lavender flowers. As the flowers appear, cilantro grows tall and spindly, and it loses many of its broad, flat leaves. Prune the flower stems when they appear to keep your cilantro plant growing as long as possible. Look for the stems with green buds at their ends. Prune the stems at their bases where they join the rest of the plant. Coriander seeds grow on cilantro plants after the flower pollination. If you're growing cilantro for coriander seed, don't harvest the leaves or remove the flowering stems. The seeds are ready about 90 days after sowing when the plant begins to turn brown and the yellow-brown seed pods form. Prune the seed pod stems at their bases. Hang the seed pods upside down in a paper bag in a cool, airy spot until the seeds fall out of their pods into the bag. You can also leave the seed pods on the plants in mild climates, so the plants self-seed.